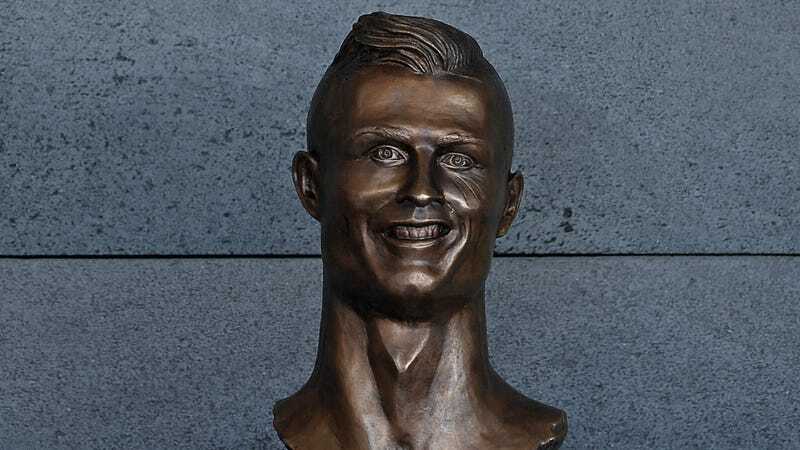 If art is supposed to be provocative, to generate questions and discussion and interest, then the bust of Cristiano Ronaldo unveiled outside the airport now named after him was a rousing success, even if it completely failed as an accurate representation of what Ronaldo actually looks like. You know who else was provocative, who made you think in ways you might’ve thought were strange and unnatural? Jesus Christ, that’s who. And it’s that model of thinking that the bust’s sculptor has sought to recreate in himself today. The eyes! For the love of god, do not look into the eyes! So apparently Santos is not blind, and has actually seen Ronaldo’s face, though maybe only in pictures. Good to know. Beauty is after all in the eye of the beholder, even if no one can stare too long into those pinched and sunken eyes to find it.